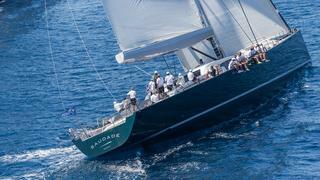 The Wally Class has announced that the Loro Piana Superyacht Regatta will be part of its official racing season. Taking place June 7-11, 2016 in Porto Cervo, Italy at Yacht Club Costa Smeralda (YCCS), the Loro Piana Superyacht Regatta will be one of four regattas that make up the Wally Class official racing calendar. The Wally Class is the largest fleet of maxi yachts in the world, with 12 to 15 yachts more than 24 metres LOA that are known to be high-tech, high-speed and highly competitive. The first Wally Class event of the season is Gaastra Palmavela in Palma de Mallorca, Spain in May, followed by the Loro Piana regatta, then the Maxi Yacht Rolex Cup, also held at YCCS, and wrapping up the season with the Les Voiles de Saint Tropez at the end of the September. At the end of the season, the Wally Trophy is bestowed to the yacht with the best results in the four events, using the high point scoring system. While Wally superyachts have raced in the Loro Piana Superyacht Regatta in their own class in past years, this is the first time that this competition will be an official part of the Wally season with the scores adding up to the final prize. Wally yachts have already proved a force to be reckoned within the Loro Piana Superyacht Regatta as it was the Wally superyacht Saudade that won top spot in Class A at last year’s event. Saudade also won a special prize for the Embraer Executive Jets Race Day Trophies. During the 2016 Loro Piana Superyacht Regatta, the Wally Class performance yachts will have different courses and racing starts, separate from the other classes. Racing to the Wally Class Rules, competition will take place over four days, with the Wally Class racing two days of coastal courses and two days of more technical Windward-Leeward courses. Now winners of the Loro Piana Superyacht Regatta Wally Class will be eligible to make the Wally Class Hall of Fame, which includes the likes of Magic Carpet Cubed, Open Season, Y3K and Magic Blue. Wally Class expects a good turnout for the 2016 Loro Piana Superyacht Regatta.